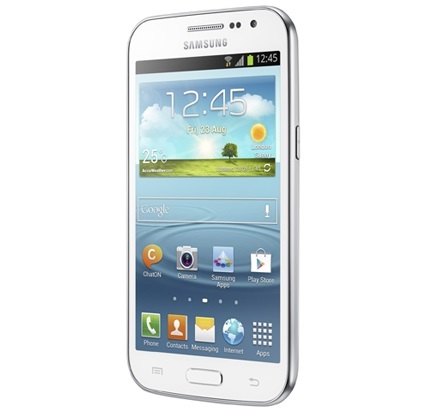 Samsung Galaxy Win announced: a Galaxy S3 made cheaper. Today Samsung have confirmed the existence of the Galaxy Win. Probably the best way to describe this is the Galaxy S3, but made more of a budget handset. There's Android Jelly Bean on board, but there's no confirmation whether or not this is 4.1 or 4.2. This will be powered by a 1.2GHz quad core processor and a 4.7 inch display with a slightly disappointing 800 x 480p WVGA resolution. The cameras have also had a slight downgrade from the Galaxy S3, on the rear there's a 5-megapixel shooter which works together with a VGA front option. The package is rounded out by 8GB of internal storage and a 2,000mAh battery. The device will be available in either dual or single-sim varieties and you can choose between two different colours which are Ceramic White and Titan Gray. Obviously this is a budget device so we're not sure if this will be offered up in the UK or America, but we expect it to arrive in Asia and possibly South America. There's also no word on pricing or availability yet.